You may have noticed my Twitter account has been a lot more active recently. Up until October this year I was silent, but broke that silence when I wrote a tweet to commemorate a great man. I started writing many more tweets since then. Moreover, the work stacks up. Seventeen syllables for ninety days makes 1530 syllables. At my old rate of a tweet a month, I’d have only produced 153 syllables in the time I spent silent. That’s a tenfold increase! I made a tweet for July 2013 a few days ago. It is about some words that appeared in my head a few days before that. I was on a long walk when the setting sun reminded me the power of light and dark. got or cold, gay or straight, and so on has always appeared to be a spectrum to me, with unattainable absolutes at the ends. The same words that told me to let light guide me and darkness define me, also told me that I have to become comfortable with the concepts that trouble me, one of them being absolutes. Here’s to your independence on this day. Remember: everyone is talented, original, and has something important to say. This is what I wrote for a tweet in June 2013. It is about how I used to commute to work for a quarter of my non-work, non-sleep hours. I tried to fit in socializing and eating to the remaining hours, and sleep took a hit. At least with so much time in the car, I listened to a lot of music I hadn’t heard before. Some of it was great and kept me awake, some of it made my yawns louder. I’m moving to a place much closer to work today, so I don’t have to mismanage the time I go to bed and then be tired the next day. It wasn’t mentioned (Twitter favors brevity), but I can now bike or walk to work. There are plenty of wells for natural light in my new place. It will be quiet and comfortable. I visited it yesterday, and even though the carpets were wet from cleaning and my pants and socks absorbed this moisture, it was comfortable to be there. Tangent: sometimes I wonder if I should be a radio personality. I think my voice sounds better than those of some of these reporters. I wrote a tweet for the month of May. It is about not really having a home right now. I’m sleeping on a bed these days, which is better than crashing on couches before I moved. My time is split between two cities an hour apart, making two hours of my day in a car. Tired of my unreliable car and too much time of the day with it, today I acquired a new used car and a trench of debt for it. I also put down a chunk of cash to have a place to call my own in this new state, rather than 40% of a spare bedroom. But for now I’m still in transition. Most of my things are in boxes. It’s a relief to know I function great with few material possessions, but it’s frustrating when I can’t find my checks or toothbrush. I made a tweet for the month of April, even though the month has just begun. So many other things have just begun, like relationships with certain people here around the current location of Port Manteau. The tweet, a haiku, is a short account about being in love with someone I barely got to know. She said, “I knew from the moment I met you that we knew each other in a past life.” I was touched by this, and I believed her. She told me this when I was sitting next to her while she was building a fire. I was across from her with candle fire in between before that. I see a fire in her eyes and I think she sees the fire in mine. I’m a Leo, she’s an Aries, and by the words of astrology we’re supposed to be hopelessly linked by our common element of fire. Fire entwines us. I have to think that if past lives actually exist, mine was spent sitting next to her previous form by the fire. All I will have to think of her soon are two of her drawings, one she made by the candle fire mentioned. One day I will probably burn these in a fire. I completely forget that she has a boyfriend when I’m around her. Why does she always sit so close to me?! I can’t imagine her boyfriend sets her on fire; he’s just around with arms around. Why do I always fall in love with a woman who’s taken?! Do I find it more interesting that way? Do I have no hope for single ladies? Sorry, Beyoncé. Really, if I’ve got any fetishes, it’s got to be that I can’t have you. I sometimes think I’m the Paperman, where the challenge to get to you is the most appealing part. I’m Wile E. Coyote, where it’s the chase, the anticipation, rather than actually eating the Roadrunner that I need. Captain Ahab fits, too. My friend P says that I’m not romantic. (Then again, upon describing my morning spent dancing to 60s rock in swim trunks simultaneously eating breakfast, he called me quite the romantic devil.) I can’t think of anything more romantic (in the general sense), than wanting the impossible and being completely irrational. (Or as my friend Bee (B?) would quote Tom Robbins, “Love is the ultimate outlaw. 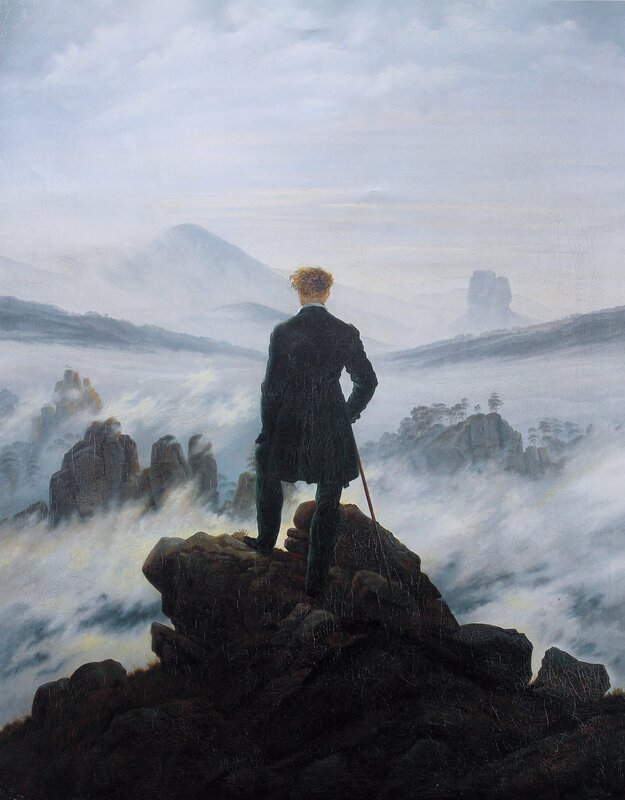 It just won’t adhere to any rules.”) This is shown in the picture below, Wanderer Above the Sea of Fog by Caspar David Friedrich. I see myself as the man in this picture. I perch on perilous precipices with that pose, pining.